Orange Parke Dodge is a five star full service Dodge dealership in Jacksonville FL. 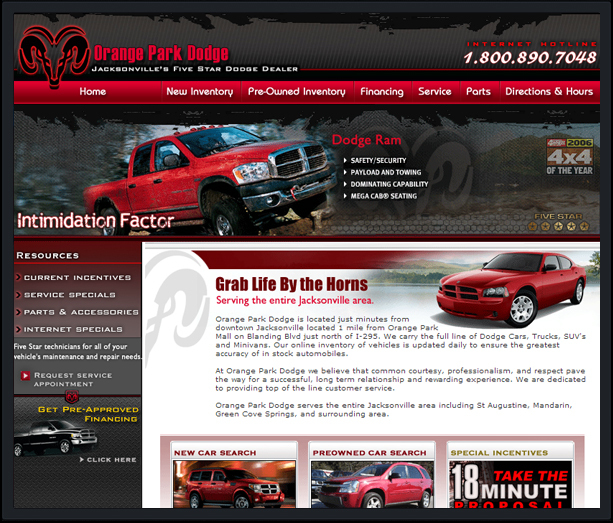 “Thank you so much for working with our company and designing two websites we are extremely proud of www.westsidedodge.net & www.orangeparkdodge.com. As we worked through the site you were very mindful of the details, which made the site a professional one and how the rest of the world would view our company image. You were very prompt and got the sites redesigned and up and running in no time. Our leads have doubled since you completed the websites! You have helped us be the #1 Dodge dealer in the southeast! Thanks again.